In my presentations, I've discussed how resources companies have significantly underperformed their underlying commodities. During 2009 and most of 2010, the performance between oil and the S&P 500 Oil & Gas Exploration and Production Index was closely correlated. 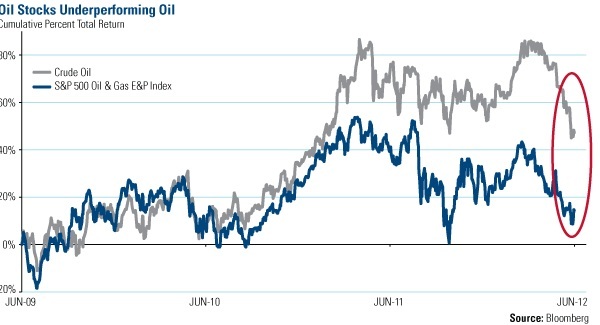 By the middle of 2011, oil and oil stocks started to separate, with crude continuing to rise while stocks deteriorated. Even with the recent drop in oil prices, oil stocks have continued to lag. 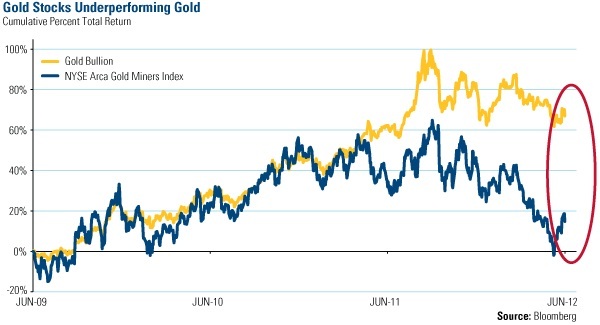 I've also discussed the strikingly similar trend occurring between gold and gold stocks. There's been a spectacular pop in gold stocks recently, but it hasn't been enough to catch up to gold's performance. The disparities mean that the cheapest resources are not found in the ground-they're listed, and it's been confirmed by recent energy company acquisitions. Chinese oil company CNOOC put in a bid of $15 billion to purchase Canada's Nexen. 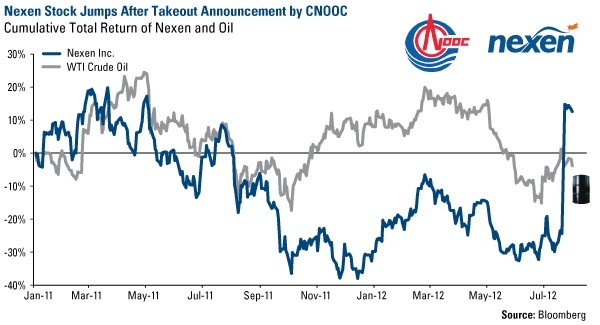 This was at a 61 percent premium to Nexen's share price on July 20, according to Bloomberg. As you can see below, not only did the takeout announcement close the gap, now the company is outperforming the price of oil. 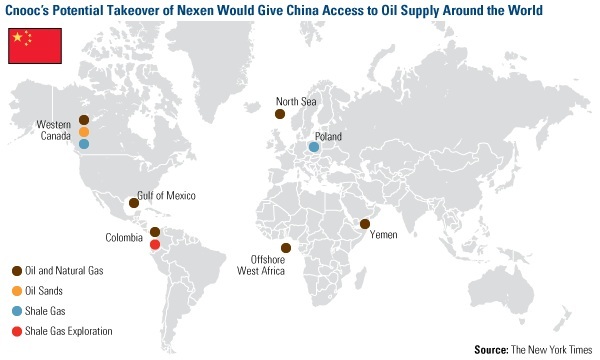 If CNOOC's deal is approved, the state-run oil giant gets even bigger, gaining access to significant energy stores in several areas of the world, including Canada, the Gulf of Mexico, Colombia and West Africa, as shown below. CNOOC's acquisition is one way China continues to acquire not only the resources needed to power the country, but also the technological innovations that come from countries with free markets and lower barriers to entry. According to The New York Times, China "has been garnering advanced production technologies to better draw oil and gas from nontraditional areas like deepwater fields and hardened rock formations." The other announcement came from Malaysia's state-owned and natural-gas giant Petronas, which will purchase Canada's Progress Energy Resources Corp.
Petronas is one of the largest producers and shippers of supercooled LNG fuel in the world. According to the Vancouver Sun, the company is "anxious to increase its market share in Asia, where analysts expect demand to surge 75 percent by the end of the decade." After Petronas' original bid was announced, Progress increased 74 percent-a record gain for the company, says Bloomberg. Are You Ready to be a Buyer like Asia? If you're contrarian investor, there may be an additional reason to jump into the market today. According to research from J.P. Morgan, institutional investors have become extremely negative, as hedge funds "essentially short the market," meaning that their expectation is that stocks will fall. J.P. Morgan looked at the rolling 21-day beta of macro fund returns compared to the S&P 500 Index returns and found that the ratio is at an extreme level of -0.26. Research shows that the last two times the ratio fell this low-in September 2010 and February 2012-stocks rallied. In 2010, the S&P 500 climbed 26 percent in five months; in 2012, stocks rose 8 percent in two months. These signs the market is sending out make it an especially attractive time to "mine" for investment opportunity. In July, we began to see energy stocks and oil get recharged, as the energy sector in the S&P 500 was the second best performer, increasing 4.17 percent and crude oil rose 3.68 percent. Unlike the start of an Olympic race, in investing, there isn't a signal sounded to let you know when to dive off the starting block into the markets. Just make sure your portfolio is poised to participate in the race for resources.